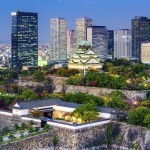 Year after year, Japan tops travel “best of” rankings and personal bucket lists. Once popular mainly with people already interested in the culture, this country is now one of the hottest travel destinations on the globe. Thanks to budget options and increased infrastructure the race is on to discover the unknown beyond the popular. Most travelers want to get off the beaten path, but are routinely stopped by the anxiety of language barriers, getting lost, or the usual unknowns that mindful travelers must respect. That’s what makes Japan an ideal venture away from the familiar in 2018: There’s no safer place on earth to take a risk. Disembark at a random train stop, rent a car and drive into the wilderness. Read on to get lost in our top 10 Japan travel destinations for 2018. Modest Yamagata City became a UNESCO Creative City this year, thanks to its internationally acclaimed documentary film festival. 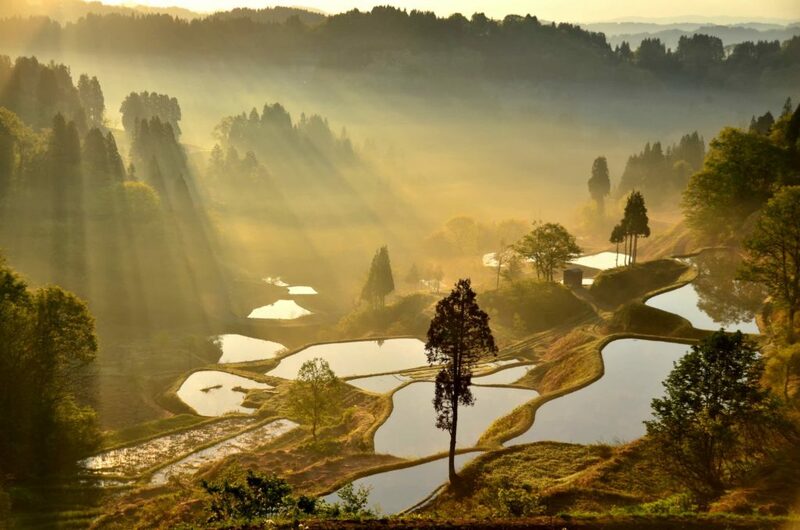 The surrounding prefecture’s rugged natural beauty draws film production crews in droves, so you might recognize some sights from the silver screen. Don’t miss: Zao Onsen’s “snow monsters”– evergreen trees that freeze in the cold and are covered by snow to create huge, bizarre sculptures. Or try a few equally as spiritual but enjoyable-in-any-season temples and sacred areas: Yamadera Temple and Mt. Haguro. 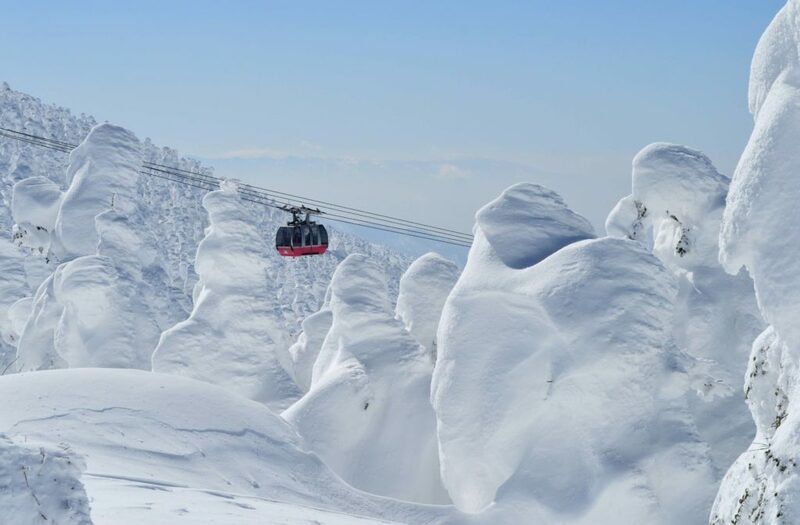 When to go: In the winter, powder chasers flock to the slopes of Zao Onsen Ski Resort. 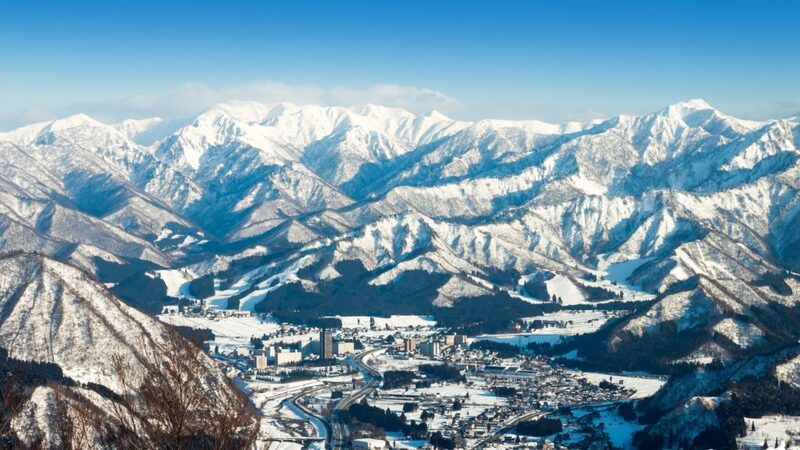 Keep an eye out for special offers and announcements, as the Japan Tourism Agency aims to attract more tourists to snow resorts. Despite Japan’s exceptional public transportation system, some of the most stunning rural areas are hard to access by train or bus. 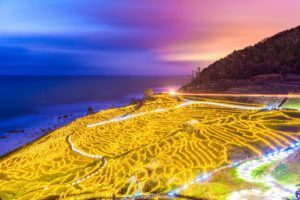 Foreign visitors don’t often think of renting a car in Japan, but it’s worth it to explore places like the Noto Peninsula in Ishikawa Prefecture, dotted with fishing villages and chiseled by the roughness of the sea. 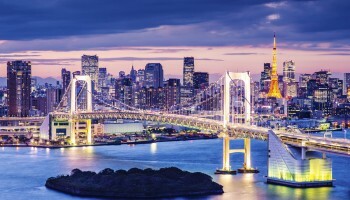 And don’t be in a hurry to return your rental: Japan recently launched sales of the Japan Express Pass, which allows foreign tourists unlimited travel on highway networks across the country. 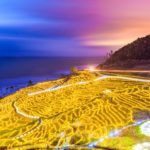 Don’t miss: The Shiroyone Senmaida rice terraces are 2,000 rice fields stacked steeply over the Sea of Japan, that catch the light of the setting sun. When to go: Summer is roadtrip season. 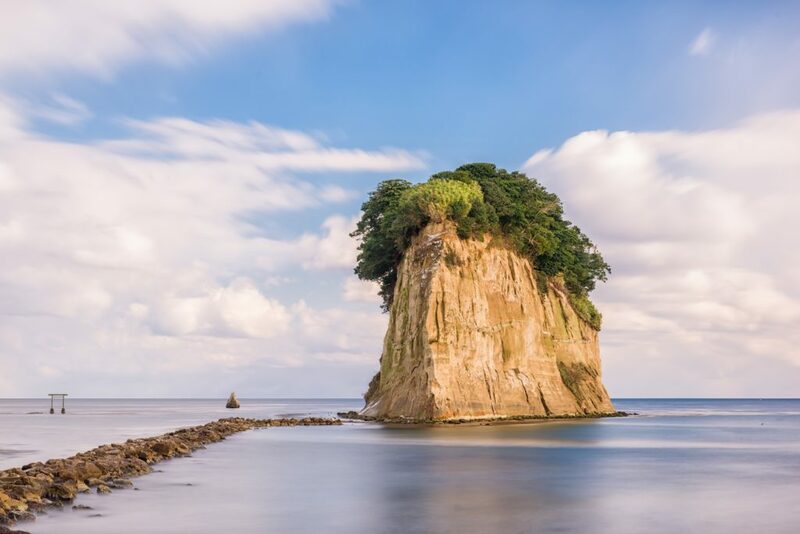 From March to November, tour boats sail from the Noto Kongo coast and pass Ganmon Sea Cave, a massive rock formation with a hole carved out of it. 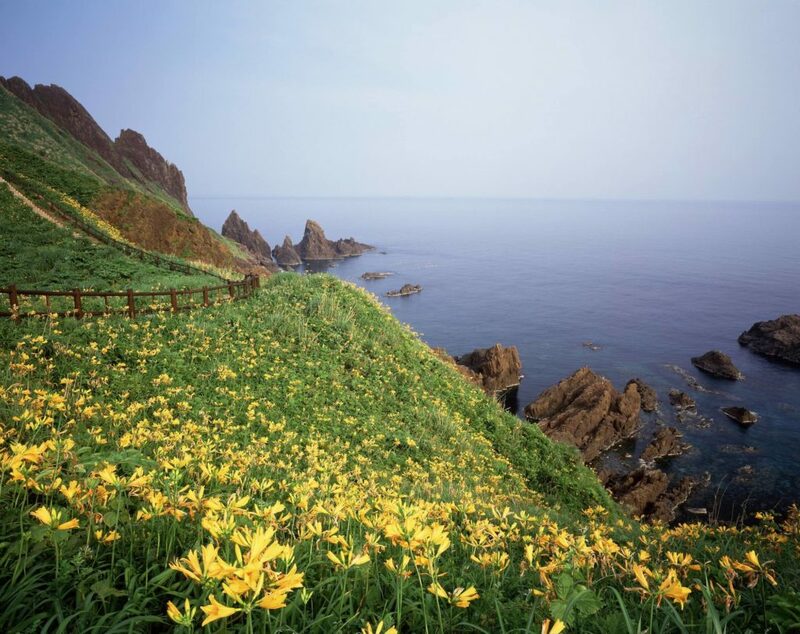 Photo by: quantdiato Okinawas Daito Islands are exceptionally remote. This is one of the islands called Minami Daito. 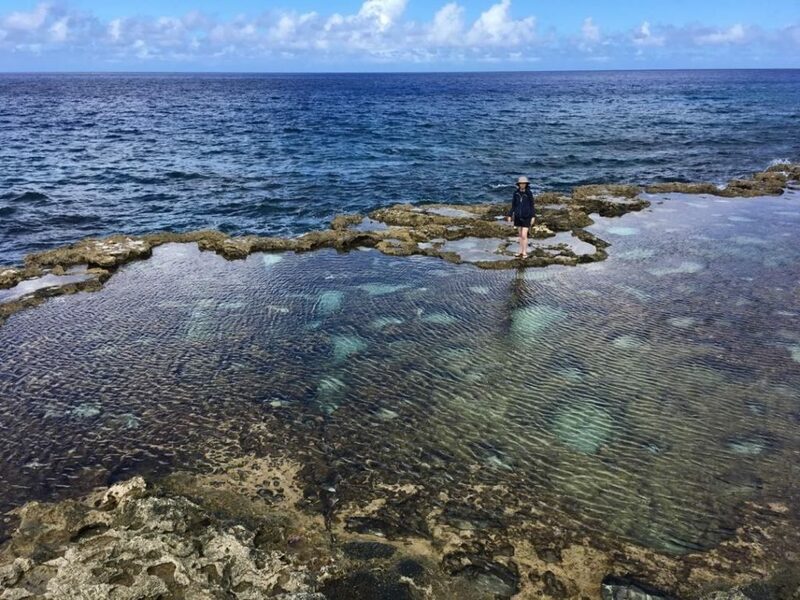 Okinawa’s pristine beaches need no introduction, but the new year will bring even more visitors thanks to the region’s official “Add On Okinawa” campaign. The prefecture is actually made up of 160 islands, so don’t limit yourself to the favored few. Go off the grid at the remote Daito Islands archipelago. This Wildlife Protection Area boasts an array of endemic species and a way of life that prizes sustainability. The largest of the islands has a population of just 1,400, so prepare for a level of hospitality that’s exceptional even for Japan. 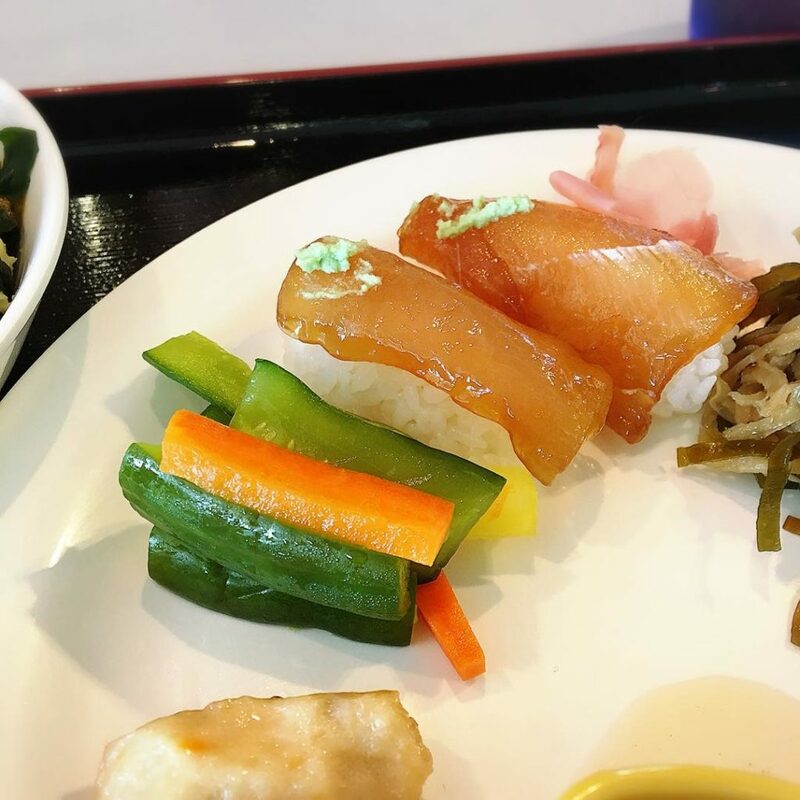 Photo by: masumitsuha Diato sushi from Minami Daito island with colorful pickles. When to go: In September, Kitadaito (one of the three isles) hosts a summer festival that features both Edo- and Okinawan-style sumo wrestling. Photo by: Jrobkatsuura Yokohama’s Minato Mirai district. The year 2018 is the 150th anniversary of the Meiji Restoration, so visit the origin site of Japan’s modernization. History comes alive in Kanagawa, whether you’re witnessing Japan’s opening to the world in cosmopolitan Yokohama (Japan’s second-largest city); piecing together the samurai clan alliances of the Kamakura shogunate in once dominant Kamakura city; or seeking rejuvenation in the centuries-old hot springs of Hakone. Don’t miss: One of the most iconic views of Mt. Fuji, towering over the striking red torii (gate) of Hakone Shrine, can be spotted from the shore of Lake Ashino. When to go: The port city of Yokohama in December feels almost European with its German-style Christmas markets. If the twinkling lights don’t put you in a romantic mood, then the mulled wine will. Ikuchi Bridge in Seto Inland Sea. Japan’s beautiful landscapes start to blur together from the window of a high-speed train. One of the travel trends we’ll see in 2018 is immersive travel adventures — think hiking, biking and rafting — that give you control over your journey. 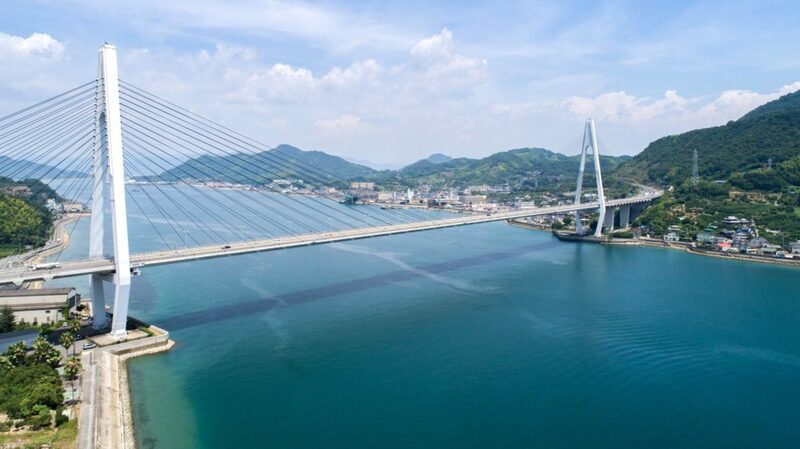 Take a bicycle ride across the Shimanami Kaido, a series of bridges connecting the islands of Honshu and Shikoku, to experience the beauty of the Seto Inland Sea with all your senses. Don’t be intimidated; the 70 KM bike route is separate from the highway and features gentle inclines, making it great for beginners. 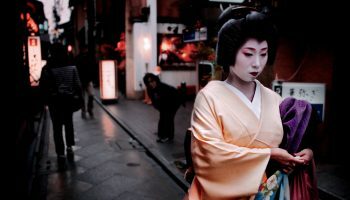 Don’t miss: Even though the trip can be completed in a day, get off the road and stay the night at a cozy inn or ryokan midway to appreciate the local culture. When to go: Spring or early fall are the best times to cycle the route, avoiding summer’s suffocating heat and the havoc of typhoon season. 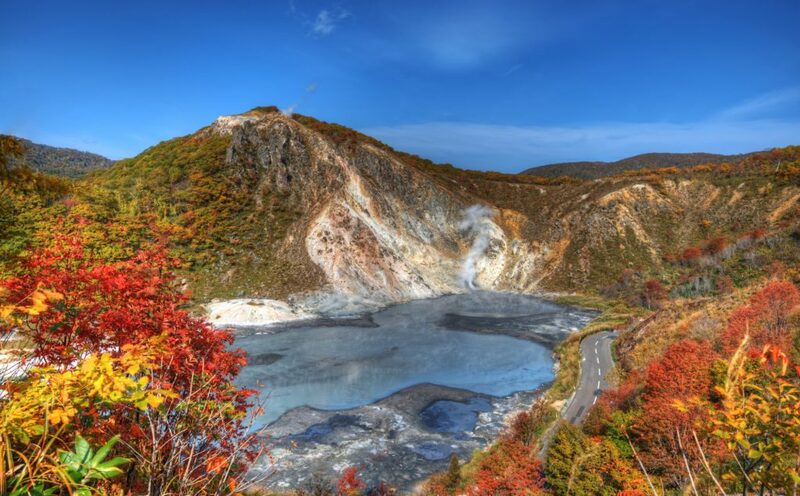 A smelly, bubbling sulfuric pit is perhaps not what you’d expect to find on National Geographic’s list of the top natural wonders in Asia, but that’s just what Noboribetsu’s Hell Valley is. It supplies the precious hot spring waters here, long believed to have healing powers. Many of the baths offer views of Hell Valley’s rust-colored hills and spitting steam vents. This is a hot spring resort that captures Hokkaido prefecture’s wilderness; it puts you at the heart of a harsher, awe-inspiring side of nature. 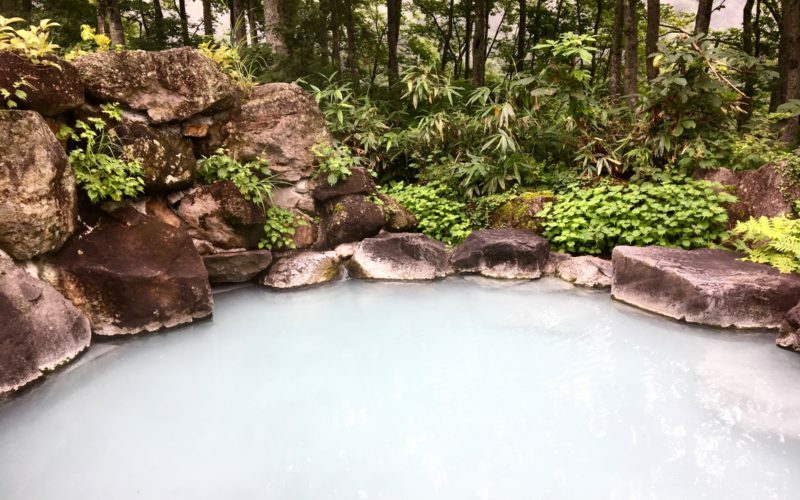 Don’t miss: Hike through the woods to the Oyunuma footbath, a natural hot water river that will carry your worries away with the flow. When to go: Jigoku Matsuri takes place the last weekend of August, when demons descend upon the town for two nights of revelry, folk dancing and fireworks. 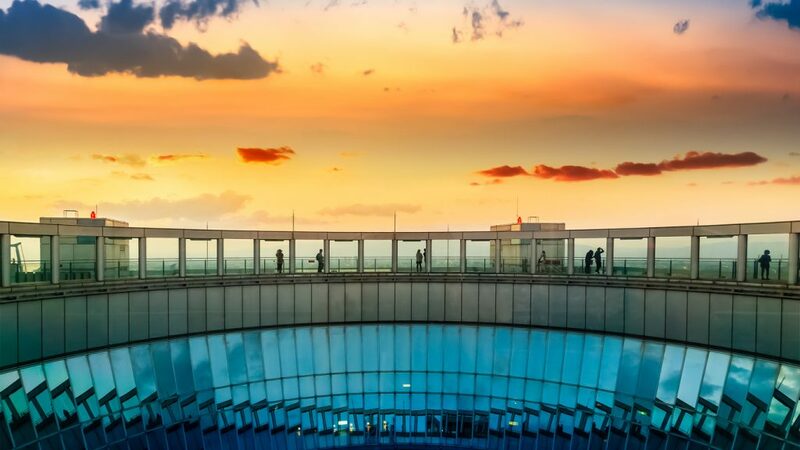 Japan’s third-largest city is hardly a secret, but this megalopolis is worth more than a short stopover on your way to Kyoto. 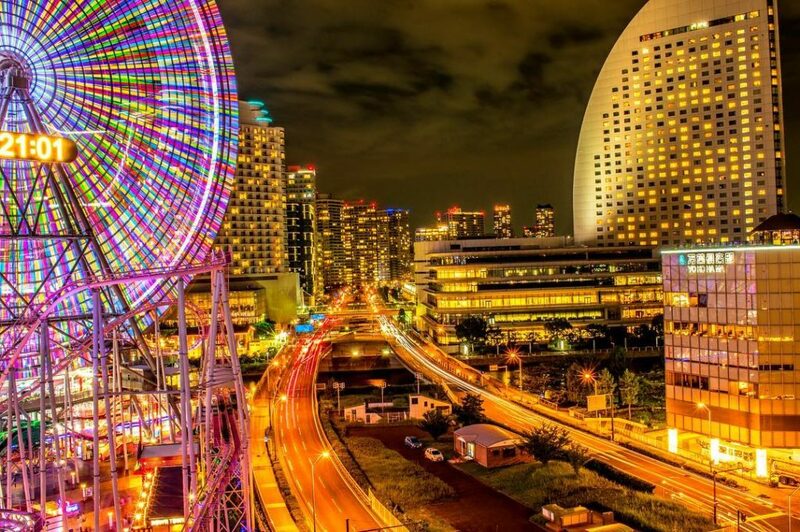 Osaka is seeing a huge boom in tourism, thanks in part to its laidback and rambunctious atmosphere. This is the No. 1 place to gorge on what the 2018 Waitrose Food and Drink Report labels “dude food” — the unpretentious, local pub fare that’s gaining popularity over fine dining. What’s more, Universal Studios Japan is set to resume nighttime parades next year. The newest installment in the Cool Japan program teases a Sailor Moon attraction, plus a new airship ride through the world of Final Fantasy. 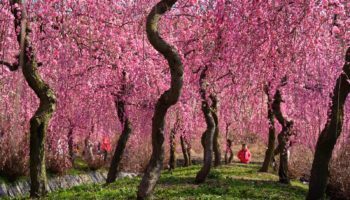 Don’t miss: Osaka’s best hanami spots aren’t as crowded as Kyoto’s during cherry blossom season. Picnic in Sakuranomiya Park, where the Okawa River is lined with flowers as far as the eye can see. When to go: Osaka’s biggest summer bash is the Tenjin Matsuri, July 24-25, when costumed float-bearers take over the streets and the river. 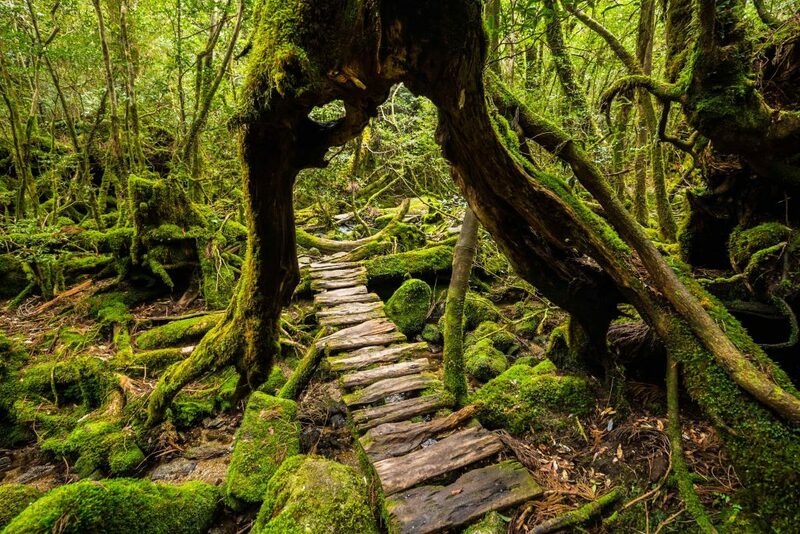 Yakushima, a small island in southern Japan, was one of the first places in Japan to become a UNESCO World Heritage Site. Celebrate the 15th anniversary of the designation with a trip to the mysterious island paradise that inspired Mononoke Hime (Princess Mononoke), a Studio Ghibli film about a disastrous war between humans and the natural world. Feel the weight of the film’s environmental message in Yakushima’s ancient cedar forests, where spirituality and local culture are inseparable from the land. In light of the dire threat of environmental destruction, responsible travel must be ecologically friendly. Hike in reverential solitude, or follow a guide who can shed light on the importance of every tree. A forest walkway that goes under a large cedar tree. 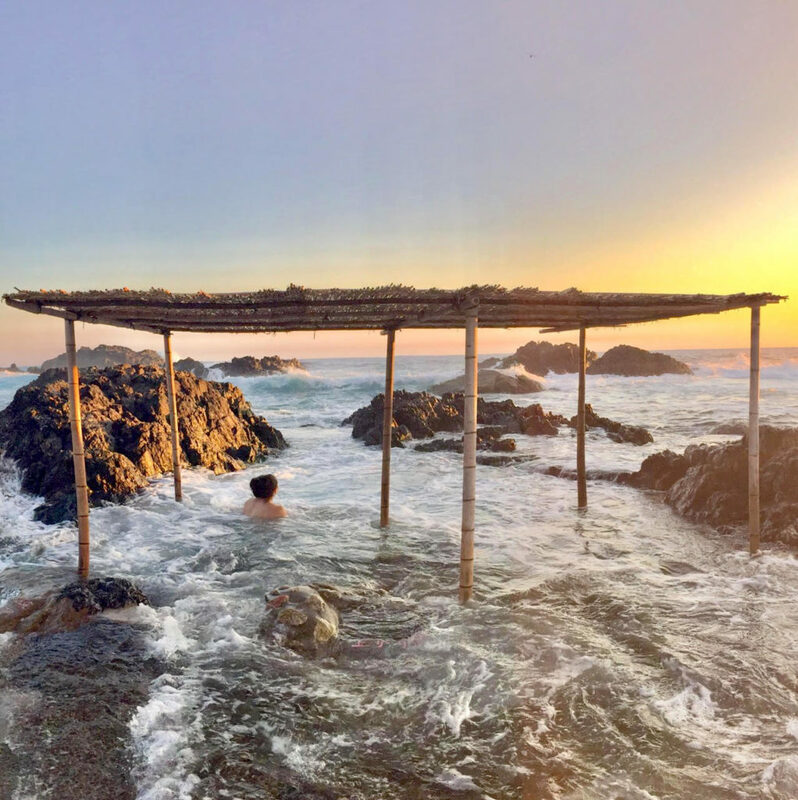 Don’t miss: Elegant hotel hot springs are luxurious but revel in the freedom at Hirauchi (pictured above) or Yudomari onsen, natural hot water pools right on the edge of the tempestuous ocean. When to go: Although summer is a good time to appreciate Yakushima’s verdant beauty, boat trips may be canceled due to typhoons from July through September. The Sea Hell, one of the eight hells (Jigoku), a multi-colored volcanic pool of boiling water in Kannawa district in Beppu. 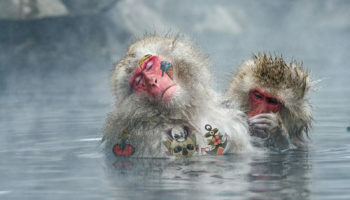 This onsen resort town in Oita Prefecture is set to host the first World Onsen Summit from May 25 to 27, where representatives from around the world will discuss global hot spring development. 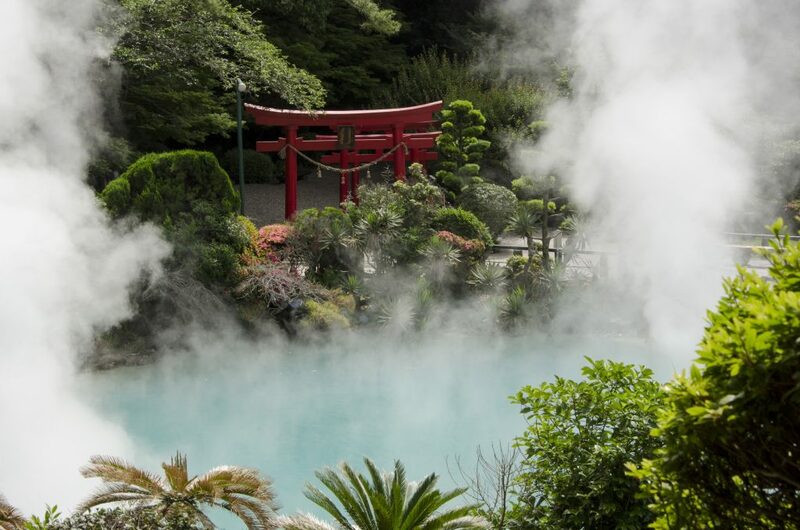 But Japan is still the best country for hot spring lovers, and Beppu proves it. Beppu is so obsessed with onsen that this year it transformed a regular old amusement park into SPAmusement Park, based on the success of one of the prefecture’s YouTube videos getting 1 million views. Even the stodgiest of onsen purists must dream of riding a bathtub around a merry-go-round, dressed in nothing but their towel. Don’t miss: Though there’s no shortage of traditional bathing options here, make sure to take advantage of the more unique experiences: like being buried up to your neck in hot sand on the beach. When to go: Onsen fever comes to a peak at the start of April with the Beppu Hatto Onsen Matsuri. Some baths are free of charge, and the mountain of Ogiyama is set ablaze in a glorious display of fire. Shrouded in mountains at the heart of snow country, underrated Niigata Prefecture is ready to shine in 2018. Every three years, the region transforms into an otherworldly open-air gallery for the Echigo-Tsumari Art Triennale. The art festival, which sees site-specific installations integrated into the local environment in surprising ways, challenges our understanding of the relationship between humans and the earth. Can’t get enough art? This year welcomed the inaugural SnowArt, a festival that’s exactly what it sounds like. The snow sculptures might inspire you to make your own art as you glide down the slopes of one of the prefecture’s 55 ski resorts. Largely ignored by foreign tourists, Niigata is known by locals for many of the things Japan is most loved for: mountains, coastlines, rice, sake and onsen. Just a short shinkansen ride from Tokyo, and you’ll be breathing in that fresh mountain air, surrounded by the best of natural and cultural beauty. Don’t miss: Fuji Rock Festival, July 27-29, will host some of the biggest musical acts from Japan and the rest of the world. Or, if you’re looking for a more traditional and scenic spot, take the ferry to Sado Island. When to go: The Art Triennale takes place July 29 through Sept. 17, and SnowArt from Jan. 24 through Feb. 11. Celebrate summer with the Katakai Fireworks Festival, or ride Japan’s longest gondola over a mountain of autumn foliage. In any season, you can’t go wrong with Niigata. Discover more about each location in our videos showcasing the best of each. If you make it out to one of these locations or just an amazing spot in Japan, don’t forget to take your photos with #GaijinPotTravel. Plus, here are the predictions from readers who were polled about their top travel spots in 2018: Readers Choice: Top 10 Travel Destinations in Japan for 2018. From all of us at GaijinPot, have a happy and travel-filled 2018!